Alexander Fateev of project partner DTU has provided an update illustrating some of the work progressing between February and November 2018 under WP1. Figure 1: UV optical absorption system used for NH3 on-line measurements (50 cm gas cell). Key components are marked. Useful spectral range (with N2 purge generator and 2x Suprasil optical windows on the gas cell): 174-300 nm. 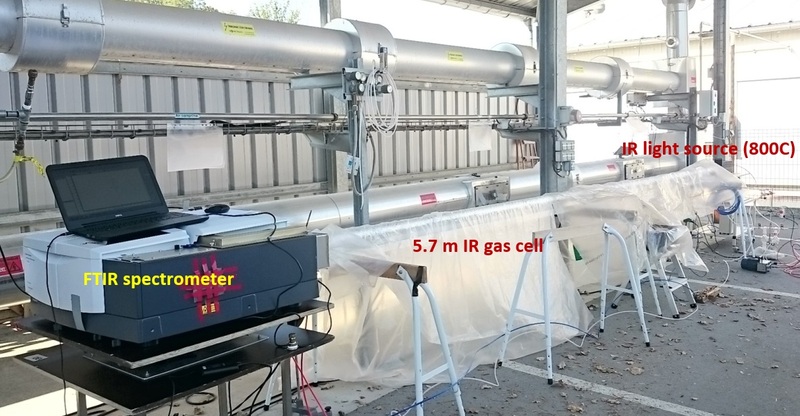 H2CO measurements have been performed with 0.39 cm gas cell with MgF2 windows. For both systems the gas has been taken from the middle point of the flow (across the flow, from access ports available at the bench) with a hated to 150C Teflon line with about 2m (UV-system) and 1m (FTIR-system). No filters have been used, i.e. stack gas flew directly into the cells. UV and IR cells have been heated to 150C. Stack gas temperature during all measurements was measured close to gas sampling locations and it was varied between 129C and 140C. Because low overpressure in the stack a pump was used to force gas flow through both cells. The flow rate was 1.2 l/min for UV and 2 l/min for IR cells. The UV cell was coated with a Teflon-like thick coating (in um-thickness) whereas the IR gas cell was coated with SilcoNert 2000 coatings (few hundreds of nm). The last one has been validated in the EUROMET funded project MetNH3 in regard to NH3 surface adsorption. It was shown that both SilcoNert2000 and Teflon have least NH3 adsorption rates compare to other materials. Because working temperature in UV/FTIR systems is 150C it is therefore expected that ammonia/formaldehyde surface adsorption will be further suppressed. UV/IR NH3 measurements have been performed with various NH3 amounts added to the stack gas in 1) natural gas, 2) diesel and 3) biomass combustion cases. UV/IR H2CO measurements have been performed with various H2CO amounts added to the stack gas in natural gas combustion case only. Some measurements have been done with NH3/H2CO in the hot gas (no combustion source). Here the results of NH3 and H2CO UV absorption measurements are presented. 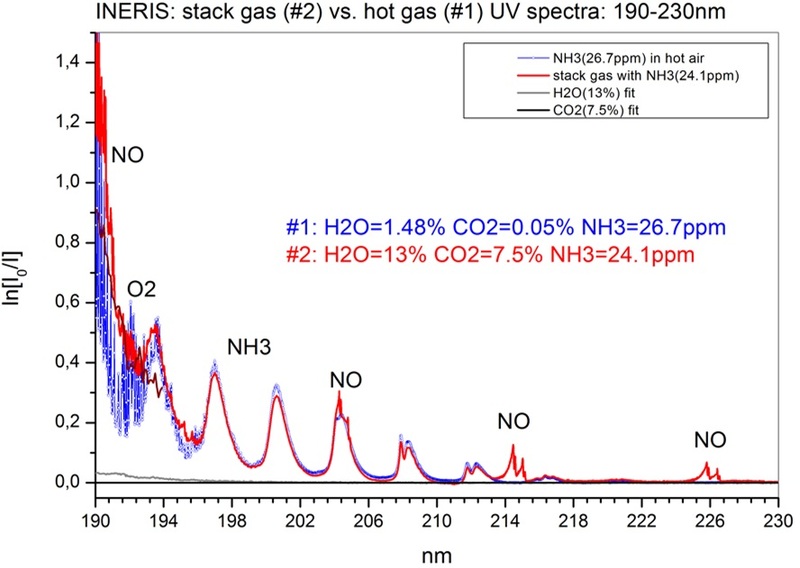 An example of NH3 spectra in hot air at 140C (H2O and CO2 traces) measured with UV-system is shown in Fig. 3. A clear difference between spectrum #1 (blue) and spectrum #2 (olive) of 1.1 ppm can easily be observed because difference in NH3 concentrations in the hot gas. The spectrum #1 or #2 can perfectly be fitted with a reference one measured at DTU. In the Fig. 3 fit of the #1 spectrum with the reference spectrum is shown by the red line. This can be considered either as a validation of the INERIS bench and NH3 injection system or DTU’s UV system the reference data sets. 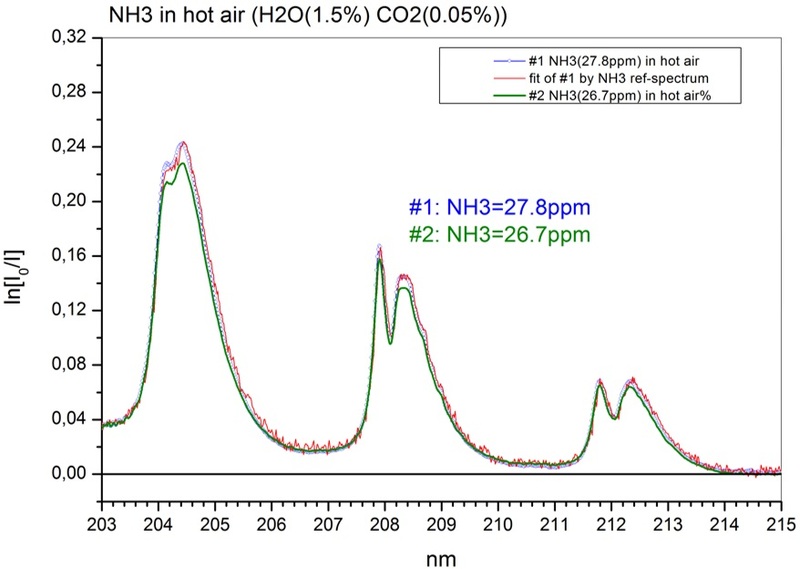 Figure 3: Part of two UV absorption spectra measured with at #1 NH3 (27.8ppm) (blue) and #2 NH3 (26.7ppm) (olive) in hot air at INERIS and fit of #1 spectrum with a reference one with NH3 (27.8ppm) (red). An example of UV absorption spectra measured with 50 cm gas cell on stack gas (stack gas temperature 140C) in 180-190 nm and 190-230 nm is shown in Fig. 4 and 5 respectively. Because high water concentration in the stack gas (H2O (13%)), the UV light will be totally blocked at 185nm. However in the hot air (H2O (1.25%)) the measurements can be extended down to about 181nm. Figure 4: Part of UV absorption spectra in 180-190 nm measured with NH3 in the stack gas (red) and in the hot air (blue). Corresponding contributions to the total spectrum from CO2 (7.5%) and H2O (13%) are shown with wine and violet lines respectively. “Noise”-looking structures are O2 absorption bands. Because high H2O concentration in the stack gas the useful spectral range for stack gas measurements starts from 185 nm (vertical black line) whereas measurements in the hot air are possible from about 181nm. The same spectra in 190-230nm are shown in the Fig.5. One can see that in 198-218 nm there is nearly no contribution from H2O and CO2 into the total spectra and therefore this spectral range can be used for only NH3 measurements if there is no interest for other gases. NO absorption bands marked have very distinguished structures and can be easily accounted in the spectral data analysis. Figure 5: Part of UV absorption spectra in 190-230 nm measured with NH3 (26.7ppm) in the stack gas (red, #2) and in the hot air (blue, #1). “Noise”-looking structures in 190-196 nm are because O2 absorption bands. 198-218 nm spectral range is nearly free from contribution from CO2 and H2O absorptions. NO absorptions band positions are marked. 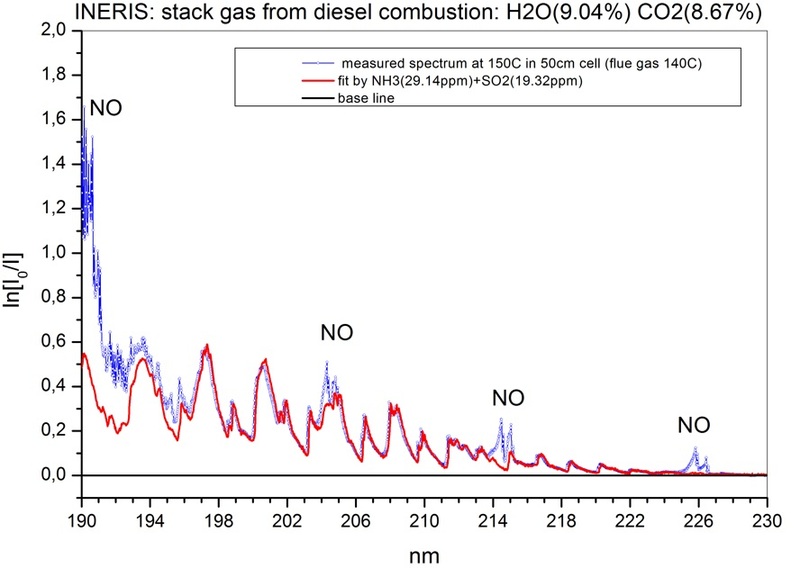 Diesel combustion gives additional challenges in NH3 measurements in tacks, namely presence of SO2 which has broad absorption features in 170-350 nm and particles (as for example soot and nano particles). Particles give some light scattering and almost wavelength-independent light attenuation 220-350 nm and most fine ones (few nm in size) may give a continuum-like absorption feature below 220 nm. SO2 has however distinguished structures well seen at moderate to high resolution of the UV spectrometer. 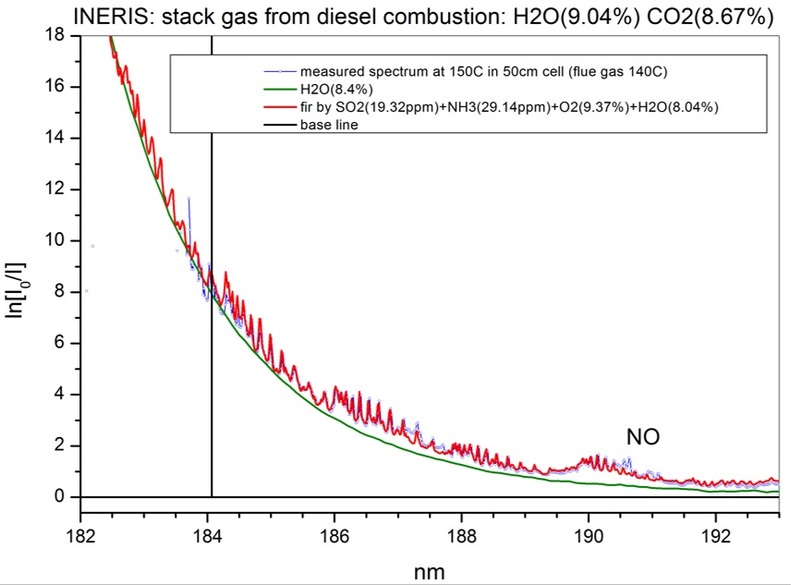 An example of the stack gas spectrum with light-diesel combustion in 190-230 nm is shown in Fig. 6 in blue together with it fit by NH3+SO2 (red). As in the Fig. 5, the 198-218 nm spectral range is free from CO2 and H2O contributions and therefor can be used for NH3, SO2 and NO simultaneous measurements in stacks. This is particular in interest for NOx reduction process monitoring where NH3 or urine is used for NOx reduction in the hot flue gases. No significant contribution from the particles has been found in the spectra. Figure 6: Part of UV absorption spectra in 190-230 nm measured with NH3 (29.14ppm) in the stack gas from diesel combustion (blue) and its fit with NH3 (29.14 ppm) + SO2 (19.32ppm) (red) only. NO absorption bands positions are marked. The same spectrum as in the Fig. 6 is shown in Fig. 7 in 184-193 nm range. Figure 7: The same spectrum as in the Fig. 6 in 184-193 nm with NH3(29.14ppm) in the stack gas from diesel combustion (blue) and it fit with NH3(29.14 ppm)+SO2 (19.32ppm)+O2(9.37%)+H2O(8.04%) (red). H2O(8.4%) reference spectrum (olive). NO absorption band position is marked. The absorption in this range is dominated by H2O and O2 and therefore this spectral range can be used for their on-line measurements in addition to NH3 and SO2. Because very distinguished O2 absorption features compare to that for H2O or nano-particles, the 184-189 nm spectral range can be used for accurate O2 measurements. As well-known biomass combustion is a common source of particle emission and a broad range of various PAH/VOC’s especially when combustion is not optimized. 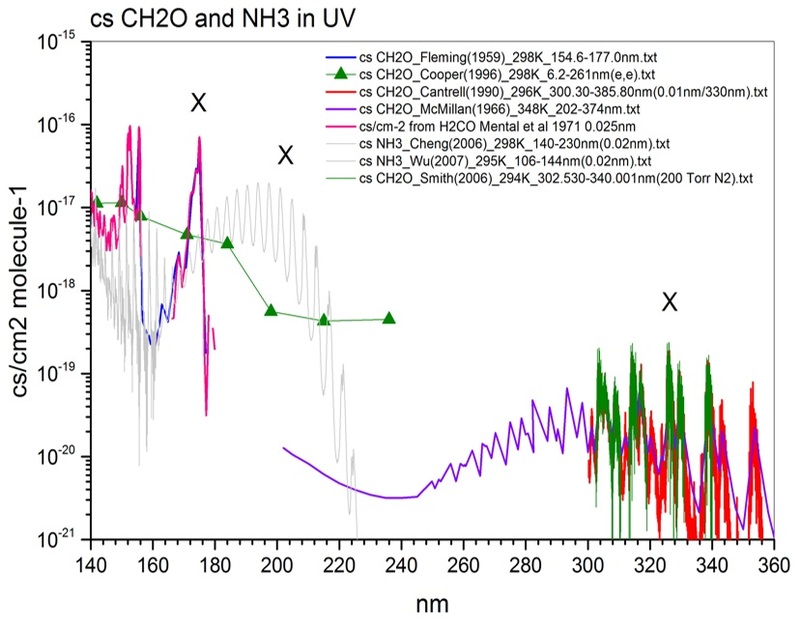 Fig 8 shows UV absorption spectra measured on stack gas from biomass combustion at about 140C with various added NH3 amounts. The measurements started with NH3(49.2ppm) and continued with stepwise NH3 concentration reduction down to NH3(2.4ppm) (spectra from blue to red in the Fig. 8). Each NH3 concentration in the bench has been hold stable for 30 min. Figure 8: Part of UV absorption spectra in 193-230 nm measured at various NH3 concentrations in the stack gas from biomass combustion (from blue to red). NH3(2.4ppm) reference spectrum is given with a pink line. NH3 absorption band at 208 nm with fine structure can be used for identification of NH3 in the gas. Other fine features in the spectra are because presence of SO2 (1ppm) in the gas. NO absorption bands positions are marked. Because particles in the gas (soot and nano-particles) and no filters between gas sampling point and the UV gas cell, Fig. 1, it was observed a change of the base line with time because particles deposition on the windows of the gas cell. As one can see from the Fig. 8 while NH3 concentration is going down, soot absorption on the windows is going up. This is in particular clearly seen in the 202-230nm. However it does not influence on NH3 measurements because even at for example NH3 (2.4ppm) the fine structure of the NH3 band at 208 nm (marked vertical double arrow in the Fig. 8) can be used for NH3 identification and quantification in the gas. As it was pointed above soot absorption gives continuum-like slow-varying absorption below 230 nm. This can be clearly seen from the last spectrum at NH3 (2.4pppm), Fig. 9, red. Apart of particle emissions, PAH/VOC’s emissions are also of environmental concern. Fig. 9 shows a part of UV absorption spectrum in 184-193 nm measured on the stack gas with NH3 (2.4ppm) (blue). Figure 9: The same spectrum as in the Fig. 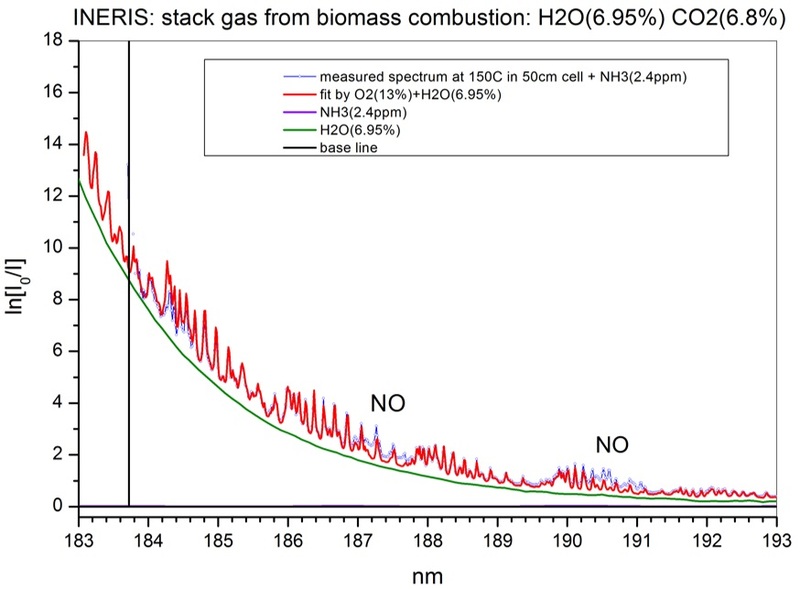 8 in 184-193 nm with NH3 (2.4ppm) in the stack gas from biomass combustion (blue) and it fit with O2 (13%)+H2O (6.95%) (red). H2O(6.95%) reference spectrum (olive). NO absorption band position is marked. One can see that the spectrum can be fitted by O2 (13%)+H2O (6.95%) (red) with some constant offset in the base line because soot absorption. Fitted H2O and O2 concentrations are in the very good agreement with those measured by INERIS with GASMET analysers. Because most PAH/VOC’s give strong absorption below 200 nm, the very good fit of the measured spectrum in the Fig. 9 show that the stack gas is clean from PAH/VOC’s. H2CO optical absorption measurements are most difficult at low H2CO concentrations. Fig. 10 shows a compilation of low-temperature UV absorption cross sections for NH3 and H2CO in 140-360 nm and Fig. 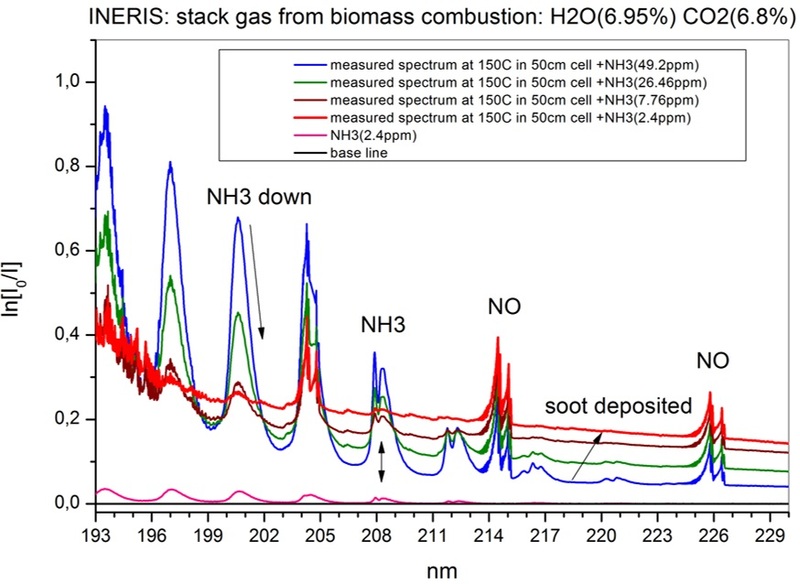 11 shows H2CO and NH3 IR absorption cross sections measured with high-resolution FTIR spectrometer at PNNL. Figure 10: NH3 and H2CO UV absorption cross sections in 140-360 nm. Wavelengths of interest for NH3 and H2CO measurements are marked with crosses. 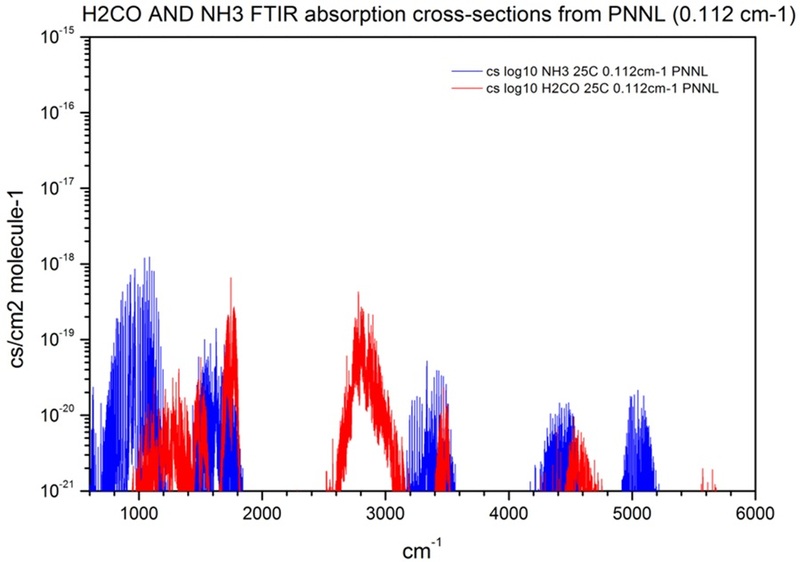 Figure 11: H2CO (red) and NH3 (blue) FTIR absorption cross sections in 600-6000 cm-1 at 25C from PNNL database. Spectral resolution 0.112cm-1. Note: the same Y-scale as in the Fig. 10. One can see that NH3 has about 17 times higher absorption cross section in UV (197nm) than in IR (around 1000cm-1). This is why the UV technique is more suitable and can be recommended for low-NH3 level measurements than the IR-based one. In opposite, H2CO has about 2.3 times higher absorption in IR (around 2900 cm-1) compare to that in UV (300-360nm). However both cross-sections are very low and require a long absorption pathlength (more than 5m) either in UV or IR for low-concentration H2CO measurements. The last mentioned spectral range is popular in atmospheric long-path H2CO measurements with use so-called DOAS-technique where few ppb detection limit can be achieved. Because molecular structure of H2CO the 240-360nm spectral range is the only one, where electronic excitation from the ground to an excited (valence) H2CO states can be observed. This spectral range is also free from H2O and CO2 absorption bands those are always in interference either with NH2 or H2CO bands in IR. As one can see from the Fig. 10, H2CO has much higher absorption cross-sections in far UV (below 190nm). Thus for example the first Rydberg state absorption band at 175nm has about 164 times higher absorption cross section than that in IR at 2800cm-1. Because high water content in the stack gas (8-11%) measurements below 180nm require much shorter gas cell (length of 1 cm or less). 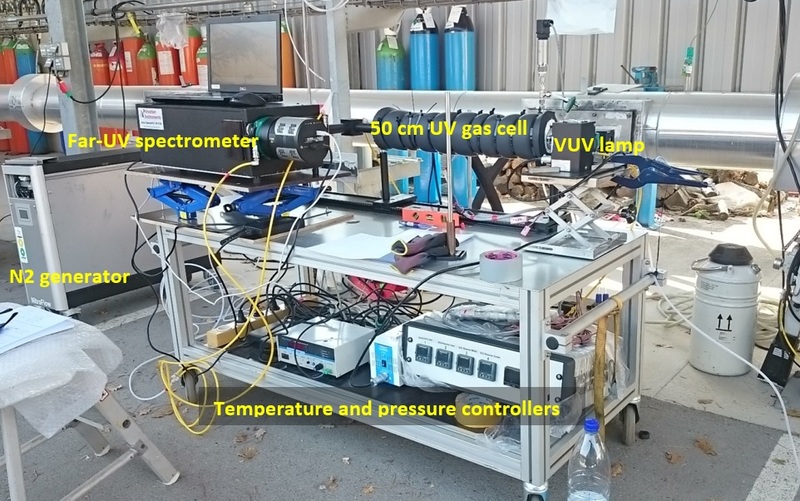 Therefore H2CO measurements in far UV have been performed with 0.39cm gas cell. N2 gas from a gas bottle has been used for purge of all optical paths. 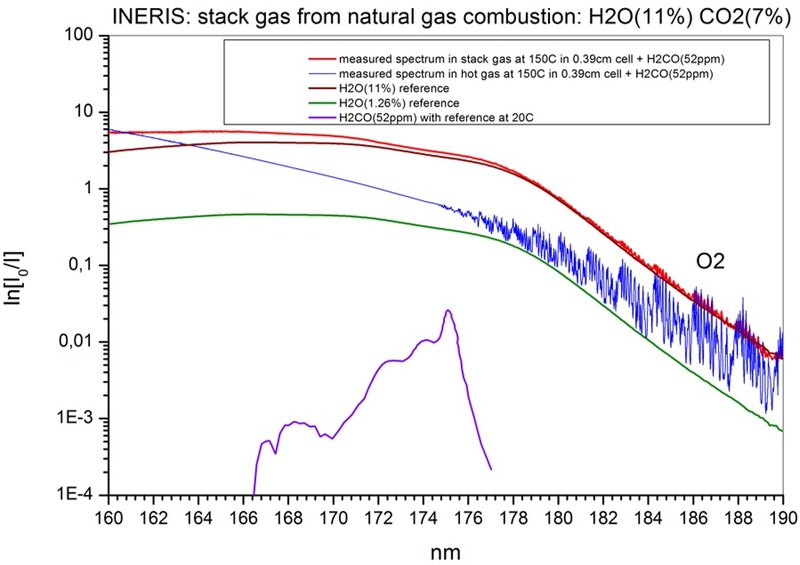 An example of far UV absorption spectrum measured in stack gas in natural gas combustion is shown in Fig. 12. 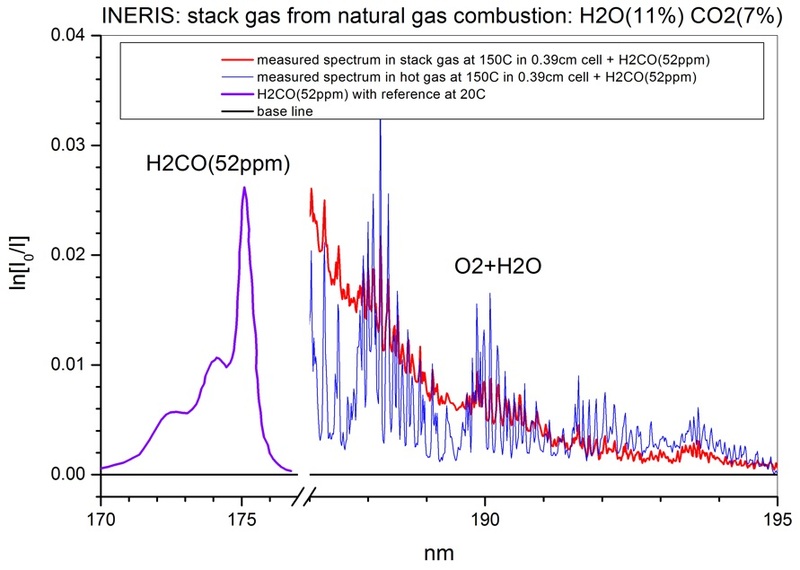 Figure 12: Far UV absorption spectra in stack gas in natural gas combustion (red) and hot air (blue) with H2CO(52ppm) additive. Corresponding H2O(11%) and H2O(1.26%) reference spectra are in wine and olive, respectively. Calculated H2CO(52ppm) absorption spectrum with use reference data at 20C is shown by a wine line. Although fitted O2 and H2O concentrations match the GASMET data there is no sign of H2CO absorption feature at 175nm either in the stack gas or in the hot air with H2CO(52ppm). Measured spectrum of stack gas around H2CO 175nm is smooth and dominated by H2O absorption. Comparison of predicted H2CO(52ppm) absorbance calculated with use H2CO reference data at 20C with that in the long-wavelength part of the spectra in the Fig. 12 is shown in Fig. 13. 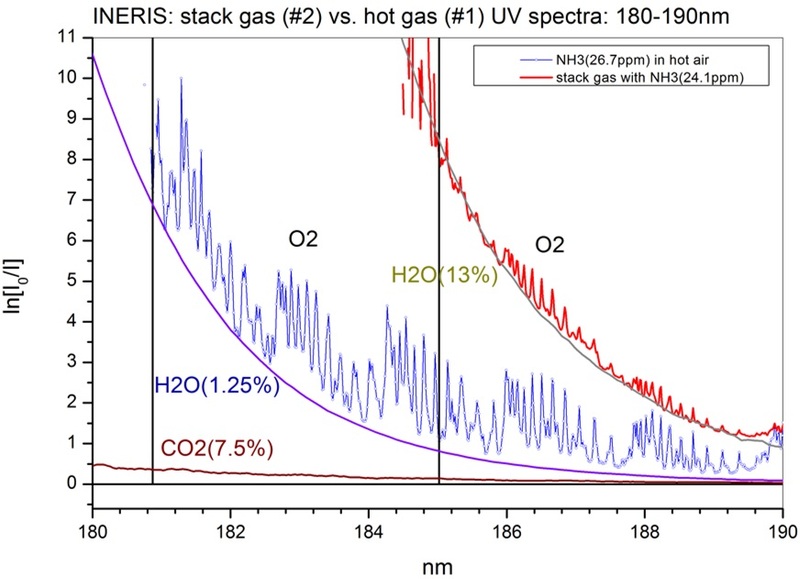 Figure 13: Comparison of predicted H2CO(52ppm) far UV absorbance in 170-176nm (violet) with that for O2+H2O in 187-195nm in the stack gas (red) and hot air (blue) from the Fig. 12. One can see that that the absorbance values for H2CO and O2+H2O in the stack gas and hot air are at the same level as one can expect to see for H2CO(52ppm). Moreover the FTIR measurements with 5.7 gas cell, Fig. 2 confirm H2CO presence in the stack. As it was mentioned above H2CO absorption at 175nm is related to transition from ground state to the first 3s excited 1B2 Rydberg state with complex and diffuse structure. The structure of this band is found to be caused by a vibrational excitation in the HCH angle which has very shallow deep by less than 1eV. Therefore absence any signature of H2CO absorption in the 170-175nm may probably attributed to 1) band shape temperature-related changes at 150C and/or 2) it fast dissociation due to increased perturbation with other 1A’ non-planar H2CO state, resulting from 1B1/1A1 mixing. The mixing becomes probably stronger with temperature rise. This requires further investigations in the lab. Possibilities for H2CO measurements in far UV should be further investigated.